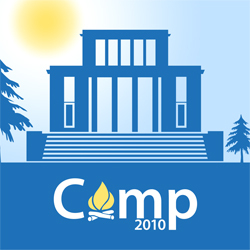 If it’s summer, then Learning Design Summer Camp is right around the corner. This is one of my favorite events of the year, because it is two days of fun with friends and colleagues. This week, Erin Long and I have been working on the #ldsc10 logos and customary camp gear, and I love this year’s fresh take, if I do say so myself. First, kudos to ETS’s own Dave Stong, who seriously helped me out with the unenviable task of trying to reach the same level of awesome that was last year’s logo, designed by Allan Gyorke. I wasn’t sure it was possible, but here is another out-of-the-park winner! I totally adore the clean, sunny feel of this logo. Where Allan’s made me think of s’mores and sunsets, Dave’s feels like sunshine and swimming. Yay to the talent and awesomeness of my community! Like the logo as much as we do? Wish you had cool and awesome stuff to wear with the LDSC logo on it to commemorate your time at with us? Bummed because the summer gods of scheduling aren’t smiling down on you and have thwarted your attendance this year? We’ve been slaving away at our LDSC Cafe Press store to bring you the coolest new swag in the hottest new colors with the crazy cool camp logos to boot. So hustle over to the LDSC Store and stock up on your favorite gear so you get it in time to wear proudly to camp! Or, at the very least, console yourself at your desk while you participate virtually and listen to streaming sessions. Because Learning Design Summer Camp gear isn’t just for those in-person attendees anymore. No, sirree, Bob! Camp gear is for the summer camper in all of us, no matter where you are–or where you wanna be! So join us in person, or join us virtually from your desk in your camp shirt and swag bag, hot coffee (or tea!) smiling at you from a LDSC mug of awesome. It’s enough to make you smile in the morning. Anyone want to put in an order early next week? I have a $10 coupon code for orders over $50. I have about $34 of stuff on my own.